Course outline: A bead loom is not just for beads! The Jewel Loom is an excellent way to create small tapestry weavings that can be used for bracelets, bookmarks and other small projects. This introductory class will teach you how to warp your loom and create a weft-facing tapestry using a couple of weaves. You’ll also learn how to add size 8/0 beads. The instructor will have samples using other materials, such as fine yarn and wire lace. 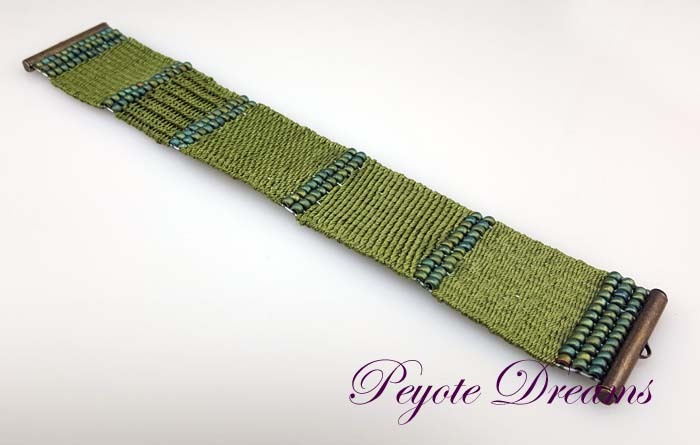 The class project will be a narrow tapestry bracelet embellished with beads. You may not completely finish your project in class but you will have all the instructions to complete your project at home. Prerequisite: N/A; some weaving experience may be helpful but not required. The instructor will provide a big-eye needle and size 11/0 seed beads used in joining your loomed piece to the tube ends.